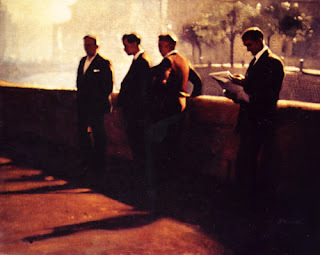 I really do love me some Anne Magill. Have had her stuff scattered around my place for several years now, and just can't get enough. Love the Hopper-esque quietude of her work, the way you never really see her subjects' faces, the way we're observing them, quietly, subtly, without intruding in any particular moment or way. The distance, the remove, the vague sense of mystery; there's a vintage feel that suits this reverie vibe. And how can you not love the use of light and shadows, especially in that second one...? 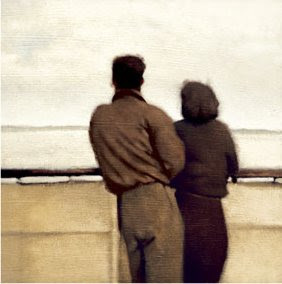 It's a cool foggy Saturday afternoon here, and I'm getting some writing done, and listening to a symphony, and Magill's stuff feels perfectly suited to that. Check her out. British artist, based in London. Contemporary stuff. Here, we've got "A Distant Wave" and "Saturday Afternoon." Cheers.